Hard candies and cozies. 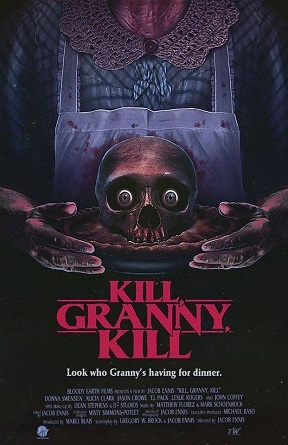 Kill, Granny, Kill strikes a blow against ageism (amongst other things) with expertly placed commas so we know that it’s not a directive TO kill granny. Complete with corny catchphrases (“the younger the meat, the tastier the treat”) Kill, Granny, Kill has one compression stocking staked firmly in the 80s. Sure, elderly killers are nothing new (The Texas Chainsaw Massacre, Mother’s Day, Motel Hell etc.) but to the best of this reviewer’s recollection, nothing has focused solely on kindly old grandma. We open with a neat touch of grindhouse scratches (a sometimes awkward gimmick that might’ve served a purpose if used throughout) and kids talking about a creepy house before we veer into more traditional slasher real estate. 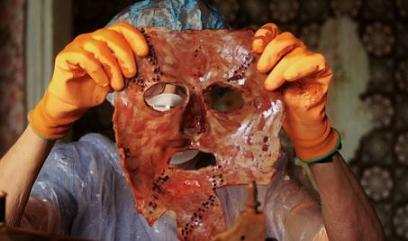 They’re promptly killed and like TCM, there’s a killer who fashions very lifelike (ahem) human masks a la Ed Gein. Elderly Mildred hires an in-home personal care worker online, with the help of her grandson (with one stipulation: no fornicating in the house) and an eager and recently underemployed collegian thinks she’s got it easy, watching “stories” with the old biddy and doing her bidding. She’s accidentally locked in the basement and naturally, things aren’t as they seem. There are flashbacks to give the killer a backstory, some knock-off doo-wop music a la Little Anthony and the Imperials/The Monotones, not-so-creepy dolls and allusions to granny’s casual homophobia/racism (might’ve been more effective to have granny be sweet and kindly through and through to underscore her meanness with an axe). Occasional flourishes of promise, marred by some indifferently awkward scenes. Donna Sweneon (Mildred) is rather amazing in the lead. This entry was posted in Horror and tagged 2010s movies by Really Awful Movies. Bookmark the permalink. I would watch this one just out of fondness for slashers.